Many thanks to Krzysztof Rechowicz, from VMASC/ODU, for making Polish an option to the CLOUDES community. Graphs of the same block type are combined into one. Click on the legend (x axis) to toggle graphs on and off. Zoom with the mouse wheel and scroll along the x-axis by dragging the mouse. Mouse over graphs to get a tool tip of data details. The paper reports on learning discrete-event simulations using project-based learning (PBL) and modeling and simulation concepts, in particular those of conceptual modeling, calibration and validation. CLOUDES is used for the simulation implementation. CLOUDES’ modelers have one more language option for building and running models. Thanks Youssef Bouanan, from the University of Bordeaux, for making French an option to the CLOUDES community. The Conceptual Design Module (CDM) has been available for some time in CLOUDES. This entry briefly explains what it does and how it works. Generally speaking, a conceptual model (CM) captures a modeler’s understanding of a system. As such, it is a simplification of the real system that facilitates its implementation into a simulation model (SM). To many, conceptual modeling is a crucial, but not an often practiced, step in creating simulations. In the context of discrete-event simulation, a conceptual model can capture events and/or the steps observed in progressing through the system. 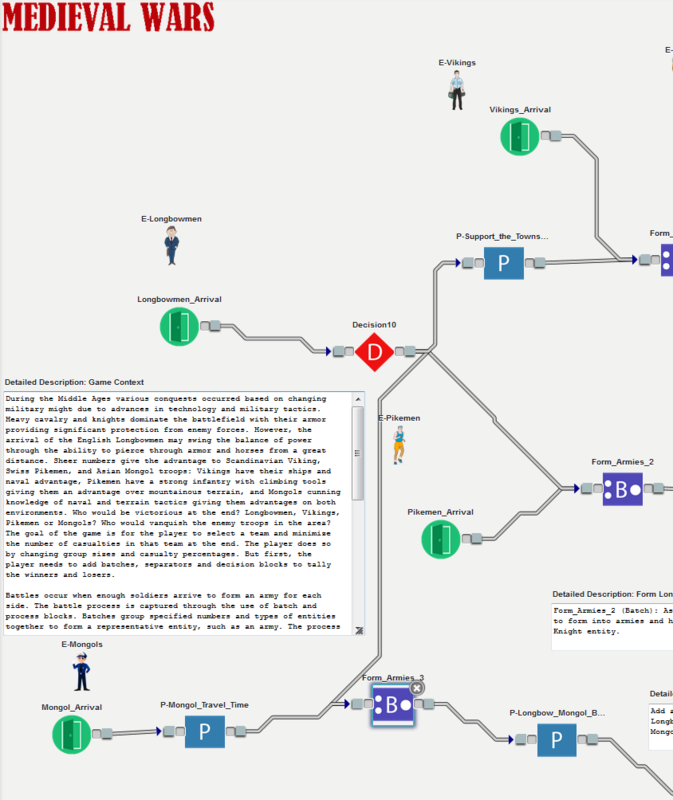 CLOUDES’ CDM builds upon a simplified form of an activity diagram that modelers can use to identify the main steps that each entity goes through within the system of interest without having to concern themselves with how to specifically implement each step. Click on the “Conceptual Design” Tab. Click on “Show” if the conceptual design area is not currently visible (the conceptual design area contains a darker color than the main design area and is located at the bottom half of the screen). The CLOUDES design area will then split into two pieces: the simulation design area is white while the conceptual design area is gray. Drag, drop, and connect “Step” blocks in the conceptual design area. Drag as many blocks into the conceptual design area until you feel that you have captured all of the main steps within the system of interest. Make sure that the Step sequence represents your conceptualization of the system. At this point, the modeler considers how each of these blocks convert into a simulation model. Define what each block represents: Arrival, Process, Exit, Decision, Batch, Separate, and Exit. Click on the “Convert” button to transform the conceptual model into an initial simulation model. Modify the simulation model as needed by adding/eliminating blocks and initializing the simulation with desired values. Note: currently, when the simulation model is updated, the conceptual model does not update to reflect any of these changes. If the modeler is satisfied with the conceptual model, then we proceed with the specification of the type of simulation nodes that each Step node in the CM represents to facilitate its conversion into a SM. Click on each of the steps and define the type (see figure). You can assign one of the following properties as the “Type” for the Step node: Arrival, Process, Exit, Decision, Batch, Separate, and Exit. In our example, we designate the first step as Arrival, the second as Process, and the third as Exit. After doing so, click Convert. CLOUDES will ask you if you want to continue with the Conversion. Click “Continue.” The conceptual model now has an equivalent simulation model (SM). At this point, the modeler proceeds to populate the properties of the SM. After doing so, the SM can be executed. As you can see, the conceptual model is simpler than the simulation model. If designing a large simulation, the conceptual model will help in capturing and simplifying the system of interest. 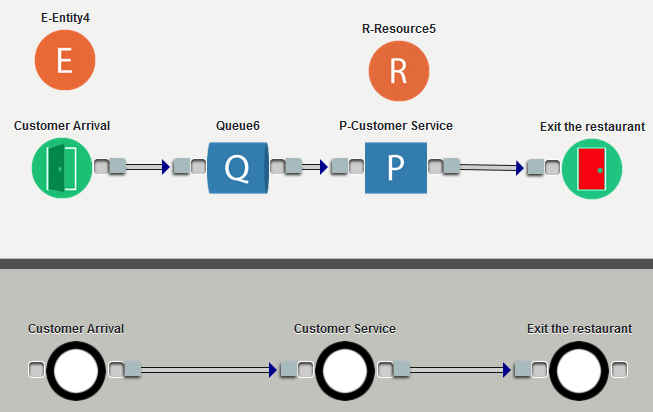 Notice that the conversion of the CM’s Arrival node generated both the Arrival and Entity blocks while the converting of the Process node generated the Process, Queue, and Resource blocks. 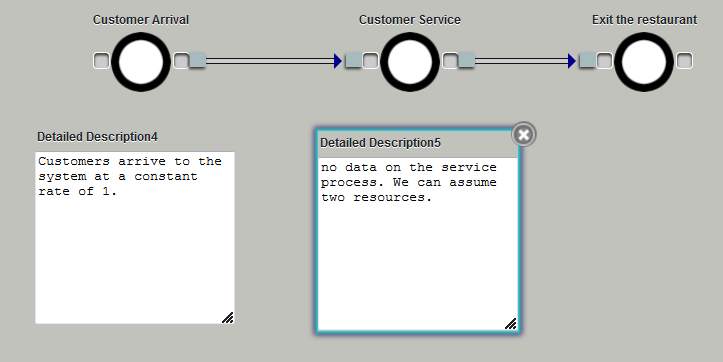 Lastly, always use the Detailed Description when building the conceptual model. The Detailed Description would allow you to explicitly capture the information and/or assumptions that go into the model as well as other important details. The CLOUDES Collaboration feature allows work in groups by letting users access the same simulation asynchronously. As such, when the simulation is open, the rest of the team cannot access it. When closing the simulation, it takes a few seconds for another user to be able to access it. Enter the email of the collaborator (CLOUDES registered email) and click Add. Add as many collaborators as you need. Give it a few seconds and the email will appear in the window. Close the window. 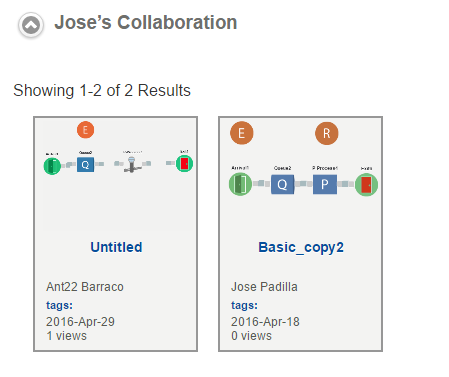 In this example, each user shared a simulation for collaboration. It may take a few seconds for the simulation to appear in the Collaboration section. The person that initiates the collaboration can terminate it by deleting emails in the Collaboration window. An invitee can also leave the collaboration by deleting its email from the Collaboration window. You can use this feature with communication tools like Skype or Google Hangouts for synchronous coordination of activities. We suggest modelers to take advantage of CLOUDES’ documenting features to make assumptions and assertions explicit in order to further facilitate collaboration. ClouDES Blog content is licensed under a Creative Commons Attribution-NonCommercial-NoDerivatives 4.0 International License.